Publication details: Book. 2011. xiv and 154 pages. Publication date: 2011-10-18. 10 tables, 4 figures and 28 photos of which 1 in full color. Hardbound. 16x24 cm (6.3x9.4 in). 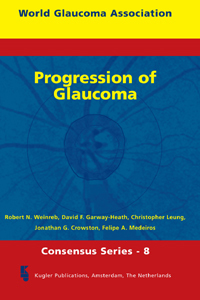 Progression of Glaucoma is the topic of the eighth World Glaucoma Association Consensus. There has been considerable attention to the diagnosis of glaucoma during the past twenty years. In fact, this was the topic of the inaugural WGA consensus report in 2003. During the past decade, however, numerous studies have been undertaken to also investigate the progression of glaucoma. With substantial improvement in existing diagnostic technologies and the rapid development of others, one can better determine whether there has been progressive disease. Hence, the results of this report will have broad and significant impact on clinical practice and glaucoma research. The global faculty, consisting of leading authorities on the clinical and scientific aspects of glaucoma progression, met in Paris on June 28, 2011, just prior to the World Glaucoma Congress, to discuss the reports and refine the consensus statements. As with prior meetings, it was a daunting task to seek and obtain consensus on such a complicated and nuanced subject. It is unclear how each of us decides how we practice, and evidence to guide us often is sparse. Collection of patient data to study progression often takes years. Hence, this consensus, as with the others, is based not only on the published literature, but also on expert opinion. Although consensus does not replace and is not a surrogate for scientific investigation, it does provide considerable value, especially when the desired evidence is lacking. The goal of this consensus is to provide a foundation for identifying progression of glaucoma and how it can be best done in clinical practice. Identification of those areas for which we have little evidence and, therefore, the need for additional research always is a high priority. We hope that this consensus report will serve as a benchmark of our understanding. However, this consensus report, as with each of the others, is intended to be fluid. It is expected that it will be revised and improved with the emergence of new evidence. We mark the eighth consecutive year for the World Glaucoma Association Glaucoma Consensus with Consensus VIII. Our topic is the Progression of Glaucoma. Global experts were invited and assembled by our international co-Chairs beginning in January 2011, to participate in the Project Forum E-Room, a unique online opportunity to facilitate discussion of each of the consensus meetings. Participants then were engaged in the discussion of five topical areas to reach consensus on key issues that surround and permeate all aspects of the progression of glaucoma. The results of these thoughtful discussions then were summarized by each of the sections with preliminary consensus statements. The Draft of the Consensus Report, including the preliminary consensus statements, was distributed to the Societies and Partners for review and comments prior to the Consensus Meeting that took place in Paris on Tuesday, June 28, 2011. On this day, relevant stakeholders engaged in a stimulating, educational, and thought-provoking session that highlighted the review and revision of the consensus statements. The Consensus Report then was finalized by Consensus co- Chairs and Editors. Consensus statements were reviewed and finalized by the expert Consensus Panel.